From my own personal daily riverbank observations I've often known before a fly is even cast whether an angler has blown their chances or not just by the way they've followed instructions or not as the case may be. All too often in this game the professional advice from the beat ghillie is not taken on board for whatever reason but probably more to do with the sheer excitement involved in being back on the salmon river than rudeness. The excitement of the salmon river often blocks quality professional ghillie salmon fishing information and seems to disrupt the ear's nerve connections to the human brain! Salmon are far more wary of us than we give them credit for and sometimes after they've been spooked they'll still show in a pool even after being moved off their lies to a different holding area by a careless angling approach. Once salmon have been rattled like that they become experts at salmon fly avoidance techniques! It's the same on the River Tay where you'll also sometimes encounter professional boatmen 'full throttling' their way right up through a salmon pool that they are about to fish back down through instead of 'carefully & logically' commuting on low revs slowly upstream on a pre-selected flight path. At night thankfully salmon pools get reset but there's no point churning up the pools unnecessarily to unsettle it's inhabitants which will only reduce the chances of success. To catch a salmon it is imperative that the very first thing you engage is it's 'naturally' cautious mind upon is your salmon fly and not some gravel crunching lateral line 'rattling' careless pool approach or the water flow displacement you've just caused by wading far too deep down through the pool. When many salmon anglers put a pair of chest waders on there seems to be an irresistible urge to go in as deep as possible but maybe that's just our salmon protection God at work! Your first swing down through any salmon pool should always be from the margins and your approach to the neck of the pool starting position should be a slow moving 'wide berthed' one! When you're approaching a salmon river with a rod in your hand keep a permanent sense of awareness as to how you are 'profiling' yourself and to the 'commotion' levels you may be creating. Personally I always fish with far more faith if I'm certain my wading or boat approach was perfect with minimal disturbance to the salmon pool. 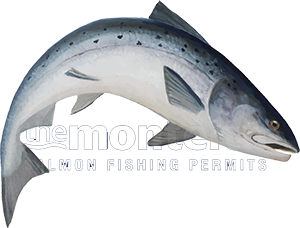 This aspect of salmon fishing is another often unspoken one as many fishers just go into 'autopilot' when on the salmon river without much thought about this important topic. When you're salmon fishing let your mind flicker between salmon fly control behaviour and how carefully you're fishing down through a salmon pool which will bring you greater success. Most salmon fly fishers are under the completely wrong impression that salmon will always be found in the deepest most furthest away point in the salmon river. This is mainly only ever the case when salmon anglers from both banks have herded the fish there! I've been completely shocked on numerous occasions over the decades by just how close to the riverbank undisturbed salmon will take up their lies. As a professional salmon ghillie give me the artistic 25 yard consistent fly controlled shin depth fly fisher any day over the deep wading 40 yard plus distance orientated 'salmon scattering' specialist who has zero fly control thoughts or actual basic salmon fishing awareness.